I call it my annual pilgrimage to the land of my people. 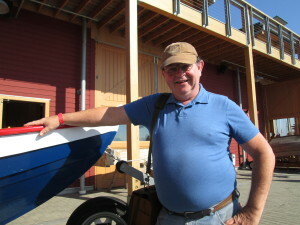 I love to walk the docks and talk to other people who are in some degree obsessed by boats,especially the wooden kind. 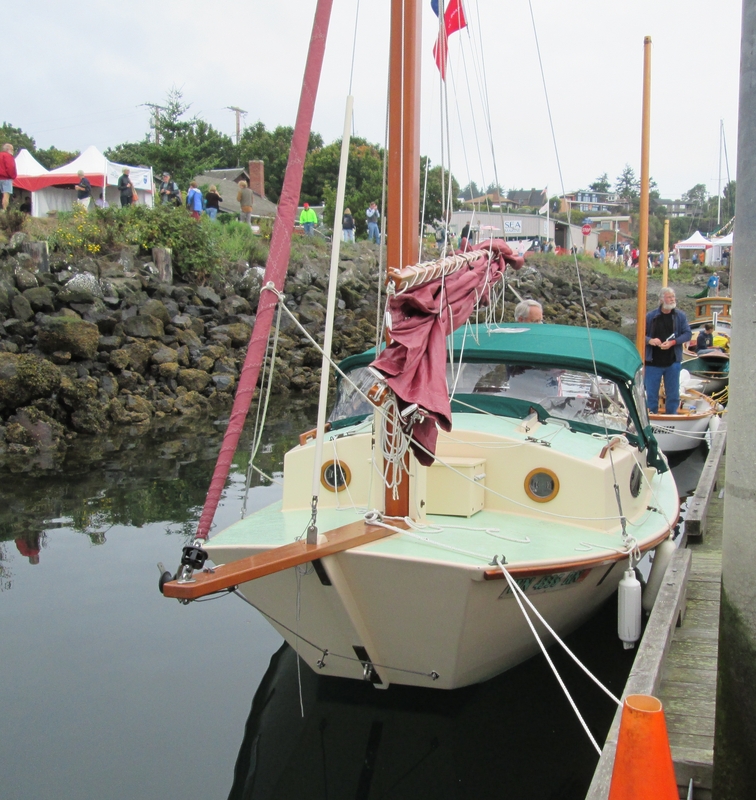 You can’t do better than the Wooden Boat Festival in Port Townsend, Washington for sheer adoration of boats made from trees. This is the Pacific Northwest where trees are like gods. Think druids and Neptune try to recreate Woodstock. Boating serves as spiritual activity for my mostly atheistic non-soul. In a world that would certainly appear insane at first glance to alien visitors we all need a reasonable amount of blatant escapism. I go to the festival to be restored and find my boat smile. Of the many boat shows I have attended in over forty years of attending many such events on both coasts this is the best one. Perhaps it’s because this festival is more than a marketplace. Many of the boats on display do indeed have a price tag but most are here to be part of a gathering. The ooh and ahh scale is off the chart. The many demonstrations and lectures are problematic because they occur at various locations and some overlapping times. I haven’t figured out either cloning or time-travel. I began my Saturday visit with a quick stroll of the first available floating dock. On one side was a line of large vessels including all the big schooners, an ocean-going tug and a Canadian life-saving boat. The other was lined with small sailboats. These were all beautiful, well made and appealing in their functionality. Wherever form follows function I am apt to tag along. I stopped to talk with Doug Korlann owner of a 16 foot Great Pelican named Toucan. This beamy little pocket cruiser has a special place in my heart as do all the boats in the San Francisco Pelican lineage. My own 12 foot Pelican was a terrifically seaworthy daysailer that gave her crew a feeling of security and provided loads of fun. Toucan is a marvel in terms of her quality construction and excellent fit and finish. Doug is the second owner and is maintaining this fine craft well and has made some nice upgrades including a boom gallows which will allow him to keep the entire rig in place along the mast when it is lowered. This will cut his setup time at the launch ramp significantly. This is crucial as Pelicans attract attention from curious boaters and all the conversation tends to slow the process down. 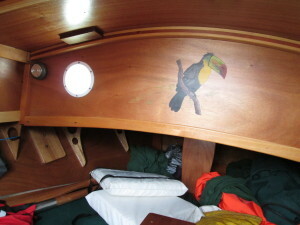 Toucan is also the only pelican I have ever seen with a canvas dodger. Toucan’s comfortable cabin has an artistic touch that I liked very much. Chesapeake Light Craft had a display area on land on the other side of the Point Hudson marina. I ambled that way taking a bit of time to check out some vendors. John Harris was holding forth at the CLC tent fielding a steady stream of questions from both interested buyers and current owners. There was a fairly complete representation of their product line. 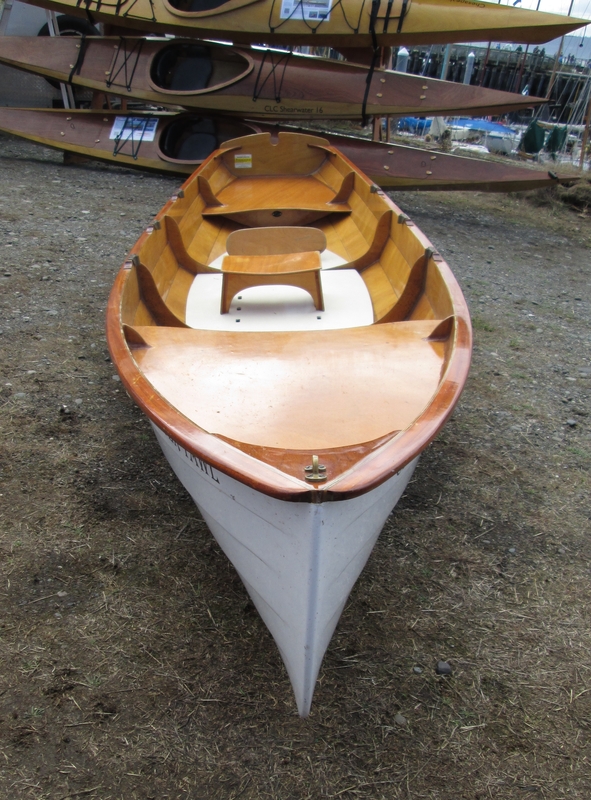 I was interested to get a look at their Chester Yawl as a comparison with the one I have helped to build. She looks good from any angle and I am sure we did well. Our modification of the forward deck and the slotted rails make our effort stand out visually. I liked the crisp look of the white hull and varnished rails. I took the time to look over the other boats in their line and would sure love to take a crack at one of their kayak kits. They come to the show well equipped with tools, building supplies and plans. This is very interesting as their main competitor Pygmy Kayak has it’s store in a building on the northside of the marina. They are both great companies with interesting products and fantastic customer service. Competition being the engine of capitalism, the arrangement is to the benefit of the consumer. Close by the CLC area is a line-up of vendors booths with products of interest to people building boats. I had an opportunity to chat with the representatives from MAS epoxy. They were very informative and ready to answer questions about epoxy and it’s application. I learned more about the product line which includes more options than I was aware of. I like the sound of their FLAG resin which is formulated for filleting and fairing without slumping. I’ve filed away their information as being especially useful in my own shop. 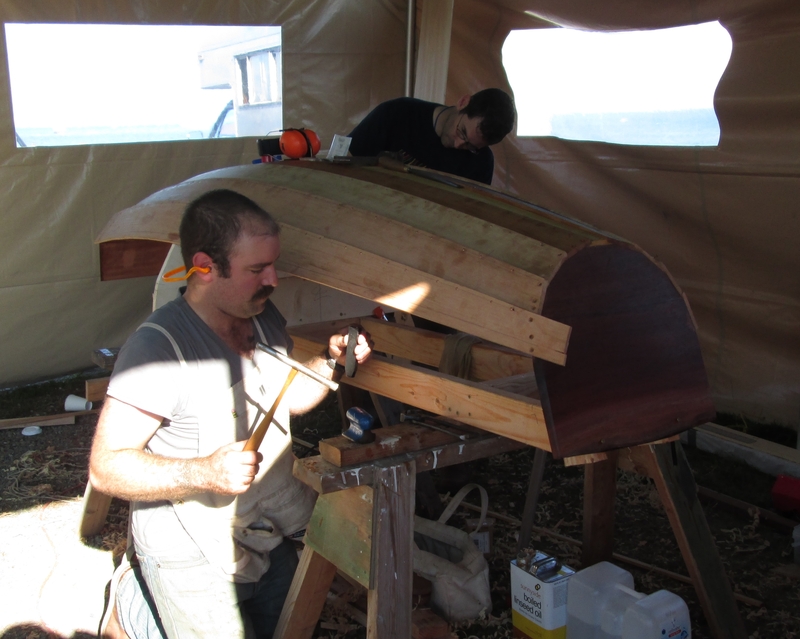 The Edensaw lumber tent featured the first, hopefully annual, boatbuilding contest. There were two challengers engaged in the three day challenge to build a boat from pile of lumber to launch. None of the parts could be cut ahead of time. One entrant was a simple plywood craft. there effort was eclipsed by the winners Wooden Boat Foundation Boat Shop Manager Scott Jones and Boat Shop Assistant Matthew Straughn-Morse. They built a 6 foot 11 inch pram. It was lapstrake planked in cedar over steam bent oak frames. I watch them setting copper rivets. They did a great job and took home a check for one thousand dollars. A highpoint of the day was to be invited aboard Pax, Kaci Chroncite’s lovely 28 foot spidsgatter. This is a vessel type that I never encountered before I came to the west coast. This classic beauty is a fine example of traditional boatbuilding. Her lines are a paean to buoyancy as displayed most strongly in her ample and shapely stern. The very word”spidsgatter” means double ender. 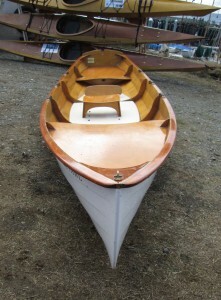 The concept is common in older expressions of boat and ship design as it preceded the invention of the transom. One almost wonders why shipbuilders ever bothered. Transom! we don’t need no stinking transom. Built in Kalundborg, Denmark in 1936 Pax has navigated successfully through a life which included fire that destroyed her main cabin. The woman shipwright that restored her displayed a level of craftsmanship that matched her builder’s. I am looking forward to Kaci’s forthcoming book Finding Pax. you can bet that I will be reviewing it for Seaward Adventures’ readers at the earliest possible opportunity. At 28′ 6″ long this is not a large vessel. Below decks she seems like a much larger boat. The accommodations are basic and seamanlike. Varnished surfaces radiate the sort of visual warmth that soaks immediately into the soul of a sailor. Never underestimate the value of nautical ambiance. 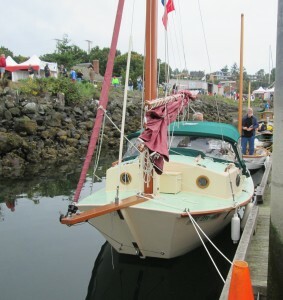 The array of talks and demonstrations at the Wooden Boat Festival is always an embarrassment of riches. I never get to everything I would like to. 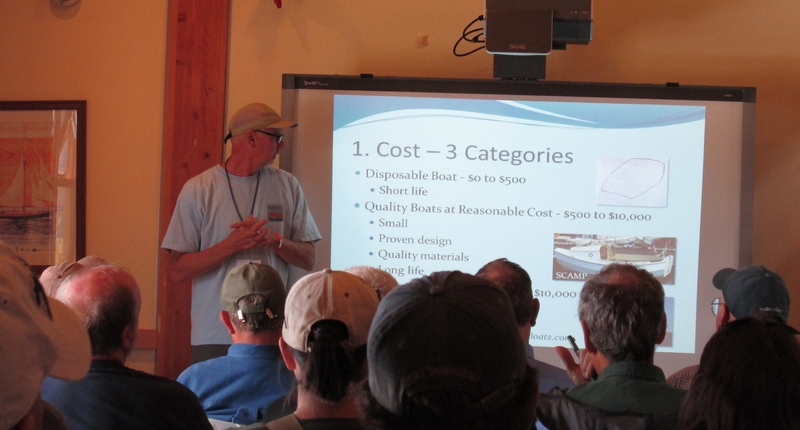 I made a special effort to get to the talk given by Dan Mattson of the podcast Hooked on Wooden Boats. I have been a from the first episode. His latest effort is an electronic book on choosing a design for your first boatbuilding project. That is just what his talk was about. 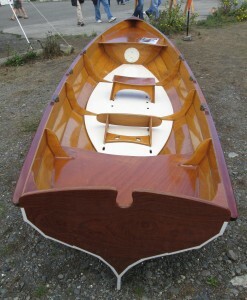 He covered the various boatbuilding methods as thoroughly as he could in the time allowed. The audience had a lot of good questions which he fielded very well. I have corresponded with Dan by email and voicemail. I was pleased to be able to speak with him briefly after the talk. Dan had his own lapstrake canoe on display as well as an 11 foot Scamp that he is in the process of building. Both boats are testimony that he knows what he is talking about. 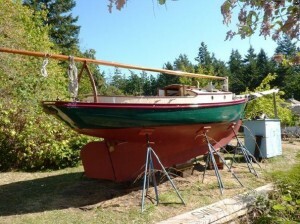 On his podcast Dan is very honest about the challenges involved in building a boat. Good instruction doesn’t sugar coat the information. Epoxy has it’s problems and the amount of sanding requires patience. Dan’s honesty and clarity is beneficial to the home builder and can be as valuable as choosing the right tools. The day went by all to quickly. I can’t get enough of being around boats. Even after I rode the shuttle bus back to my car and had a quick bite at McDonald’s The Port Townsend Shipyard beckoned. I did a drive through and drooled over a number of very cool boats including Selkie, a 25 foot carvel planked Friendship Sloop that is temptingly for sale. Port Townsend! You’re killing me here! 1977 Howard I. Chappelle designed friendship Sloop. This entry was posted in Building, Events, Sailor's crafts and tagged boat, boat-building, Chesapeake Light Craft, CLC, Edensaw, kayak, MAS, Port Townsend, sailboat, sailing, Wooden Boat Festival, Woodenboat. Bookmark the permalink.